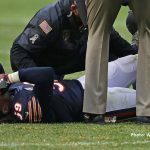 What does Illinois Senate Bill 12 Really Mean in Regard to Pro Athletes? Just prior to Super Bowl LI, NFLPA Executive Director DeMaurice Smith made news when he blasted Chicago Bears chairman George McCaskey for endorsing a bill currently before the Illinois senate which would reduce workers compensation benefits to professional athletes. Illinois, which to this point has been one of the most progressive states in regard to workers comp, has as part of their state Workers Compensation Act, a provision that pays a wage differential benefit to permanently disabled workers through age 67. Senate Bill 0012 proposes to cut this benefit in regard to professional athletes at age 35.